They say mad dogs and Englishmen go out in the midday sun – well they also go out in the freezing cold... On Saturday 17th March yellow snow warnings and force 5-7 may have put off some entrants but the Sustainability Challenge RS Aero Open at Island Barn went ahead. There may have been fewer boats but the competition with the elements was fierce. Some stayed ashore, some rigged but struggled to launch however despite the weather all three rigs were represented with local sailor Gareth Griffiths (Island Barn) electing to stick with the 9 "My fingers were too cold to swap rigs". At the briefing it was decided to drop down to three races back to back to avoid a cold start after lunch and to give travellers an earlier start on what could be a trick journey home. 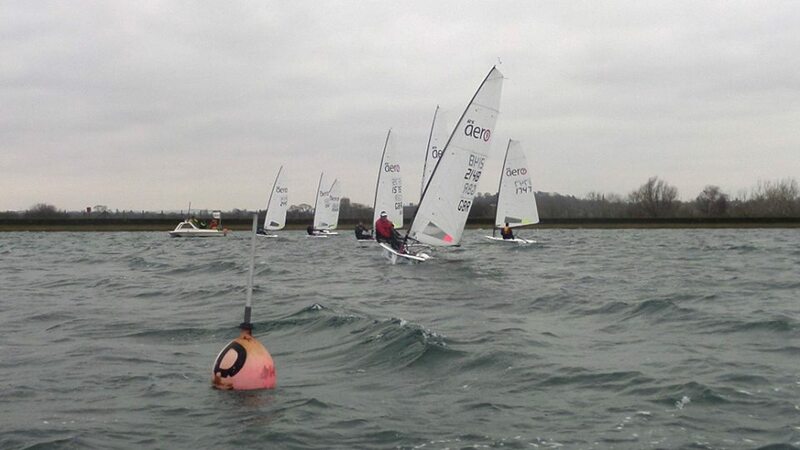 With the wind as forecast generally around 20 knots but with big squalls there were a few capsizes even before the start. Off the gun the 9 showed its pace starting at the pin and pulling away winning on the water but the gap was not quite big enough with Jeff Davison taking (Island Barn) the win on handicap by just 12 seconds from Gareth with Mark Carelton (Papercourt) third and Toby Schofield battling round in the only 5 to finish. Race two started with a similar pattern with Gareth again taking the pin end but Jeff heading the 7's. 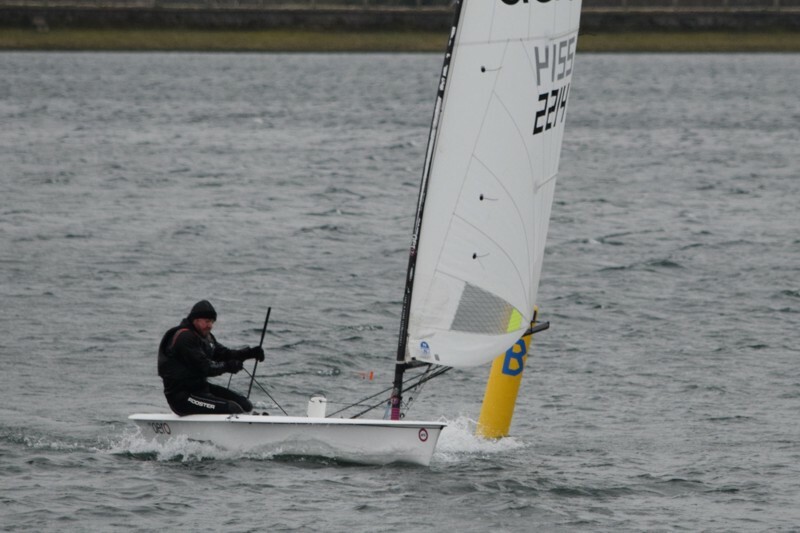 It looked to be going the same way until Gareth capsized to windward in a huge header letting Jeff take the win on the water from Gareth with the improving Tim Hire (Royal Lymington) close for second on handicap. With the wind now starting to howl and sailors getting tired race three started with a familiar pattern but this time the 9 couldn't pull away and the leading pair of 7's of Jeff and Tim took line and handicap honours with Gareth 3rd. Many thanks to Island Barn and their hardy volunteers for hosting the RS Aeros when many other events were blown off that weekend. 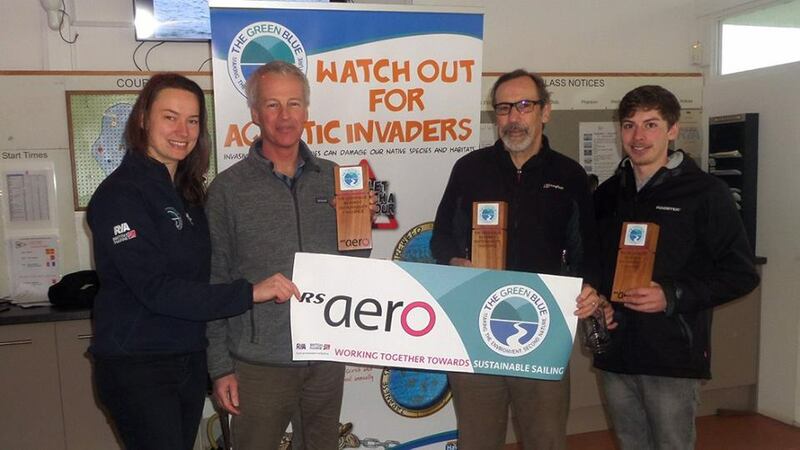 Our event partners, The Green Blue, awarded their three Sustainability Challenge Trophies for the winners in each rig for the 2nd year and Kate Fortnam of The Green Blue was on hand to present the message of how the RS Aero Class and the sport of sailing can reduce their environmental footprint and help avoid the spread of invasive species. 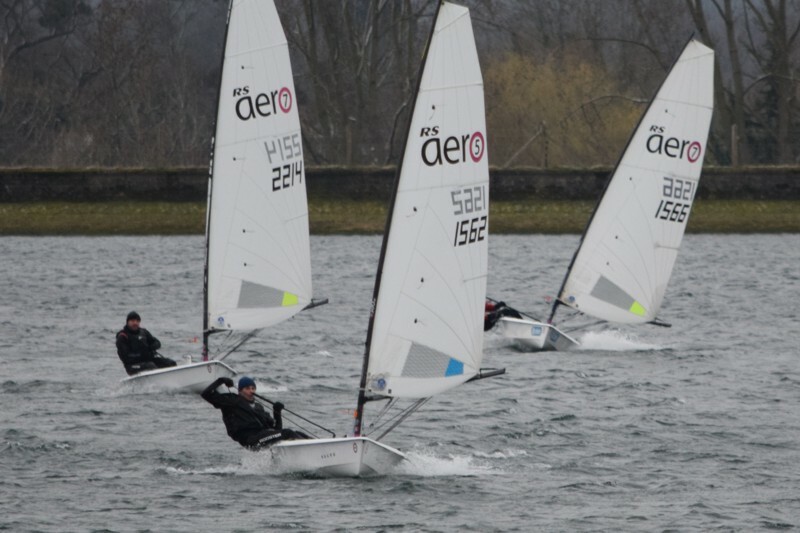 Next up the UK RS Aeros join the Hamble Warming Pan on 24/25th March for the final round of the UK Winter Series!